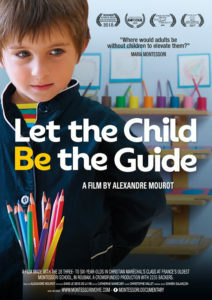 Alexandre Mourot’s documentary “Let the child be the guide” is a film I recommend to everyone interested in early childhood education. In a masterly way, which is both visually stunning and honest in its rendition, Mourot manages to illustrate not only the benefits of a Montessori classroom, but also how little formal teaching is necessary when the environment is appropriate. That is when ‘teaching’ truly becomes an art. 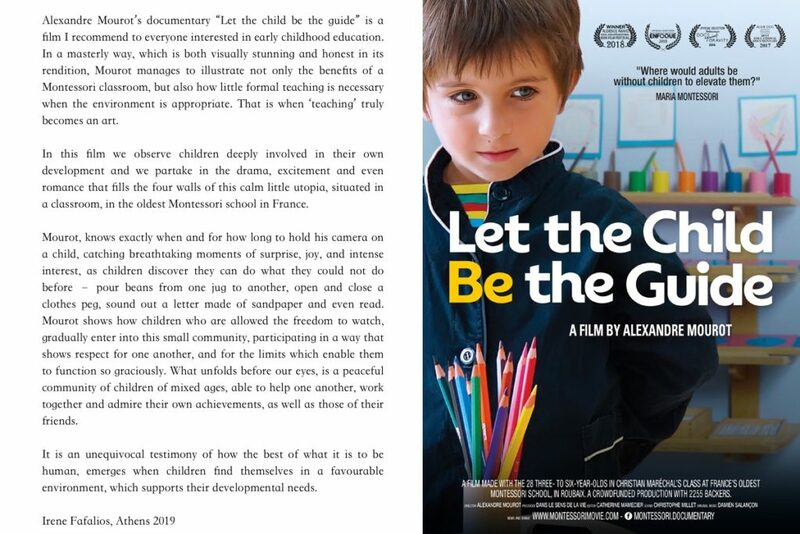 In this film we observe children deeply involved in their own development and we partake in the drama, excitement and even romance that fills the four walls of this calm little utopia, situated in a classroom, in the oldest Montessori school in France. Mourot, knows exactly when and for how long to hold his camera on a child, catching breathtaking moments of surprise, joy, and intense interest, as children discover they can do what they could not do before – pour beans from one jug to another, open and close a clothes peg, sound out a letter made of sandpaper and even read. Mourot shows how children who are allowed the freedom to watch, gradually enter into this small community, participating in a way that shows respect for one another, and for the limits which enable them to function so graciously. What unfolds before our eyes, is a peaceful community of children of mixed ages, able to help one another, work together and admire their own achievements, as well as those of their friends. It is an unequivocal testimony of how the best of what it is to be human, emerges when children find themselves in a favourable environment, which supports their developmental needs.